John’s Jazz/Pop Duo is a versatile, straight-ahead jazz group with stellar jazz pianist Andrew Carroll and others. The group performs jazz standards from the Great American Songbook encompassing a wide spectrum of styles including swing, Latin, ballad, bebop, blues, modal, and contemporary. 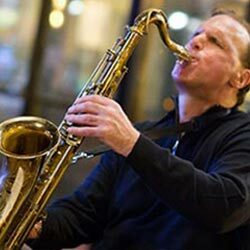 The Jazz Duo has performed at over 300 professional engagements throughout Central New York including restaurant engagements, wedding reception cocktail hours, wine tastings, fundraisers, jazz festivals, jazz concerts, private events, and corporate functions. By virtue of our working relationship with the top professional musicians in Central New York and throughout North America, we are uniquely positioned to provide an important link between our members and the diverse musical interests of the community and the public in general. Through our free two-way referral service, we are able to assist both performing artists and live music consumers to find the right music for each and every special event. There is never a charge to either our members or the music purchaser for this essential service.